Shaded Pole, Open Ventilation, Air Over. Extra studs can be cut off if not needed. Shaft can also be shortened if necessary. 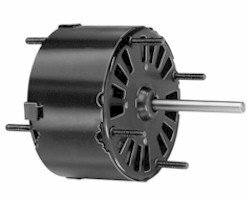 Motor is common to bath fans, humidifers and dehumidifers, to name a few applications. 1.1 Amps 115 Volts 60 hz. Motor Length Less Shaft = 2 1/2"